A German bakery stirred up trouble with its sweet-toothed customers when it offered a cake bearing the image of recently inaugurated US President Donald Trump. 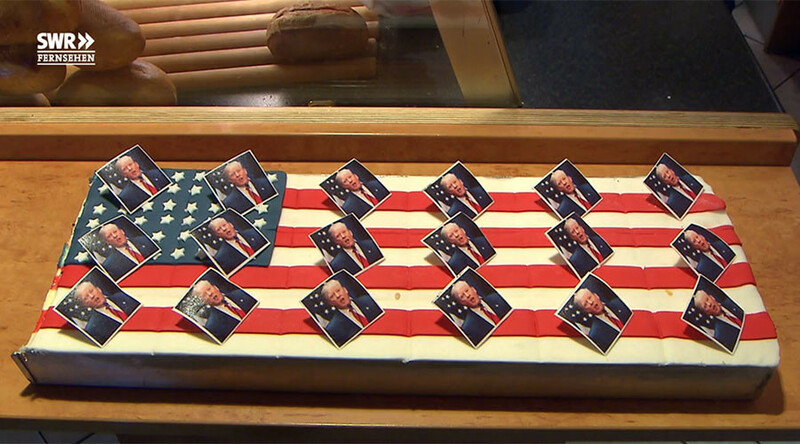 The Trump Bakery in Freinsheim decided to acknowledge their alleged distant connection with the US leader by creating a three-layer cake topped with an American flag made from gum-paste, and pictures of Donald Trump. The bakery’s owner, Ursula Trump, told German SWR public broadcaster that she initially wanted to make special inauguration buns, but instead went with the Trump cake. “The bottom layer is dark, then some cream in the middle, and then the American flag with Donald Trump on it on top,” Ursula describes her new sweet treat, which has been on sale for a week already. According to SWR, the Trumps of Freinsheim are said to be distant relatives of the US president, whose grandfather was born in the neighboring village of Kallstadt before immigrating to the United States. Ursula says the cake slices were an absolute success once she put them on her counter: in the first week, the bakery managed to sell around 150 pieces at 2.50 euros each. Yet, Trump cakes seem to have also sparked more than gastronomic delight. Ursula told the German broadcaster that some were very critical of the idea. “One woman said she wouldn’t come back to the bakery tomorrow in protest – because I’m promoting such an idiot,” the woman is cited as saying. “I said I’m not a fan of his either, but I did it for the benefit of myself and the bakery. Then another man came in and said he would boycott the bakery because I sell the Trump cake...” Ursula added. For those who didn’t get a chance to grab a piece of the Trump cake, it seems it is too late: Ursula told the broadcaster she stopped baking them as sales went flat after the initial success. Yet, those who were lucky enough now have a lifelong stock of cake-related Trump jokes. Who knows when they may come in handy?